After 22 years of working in his family’s restaurant — Rockwell’s on Merivale — Elias Theodossiou and his wife April Miller decided it was time for their own place. They found the venue for the restaurant on Preston Street — in the space where Dunn’s Famous Deli was famous for about six months. And before that, 438 (and a half) Preston Street was shared by the Italian restaurant Leonardo’s, and a strange little place called Bombay Bollywood. Theodossiou wanted his new restaurant to serve authentic Greek comfort food — like mama makes, but on fancier plates. Ottawa doesn’t have many ‘fine dining’ Greek restaurants, he tells us, and when you stop to think about it, he’s about right. There is a smattering of family eateries and fast food Greek-ish places. And there’s the long running Papagus on Kent, that renovated and became Mystiko Greek Kitchen six years back. And Theo’s on Richmond that became Oreks Souvlaki. And there were Aroma Meze’s attempts to bring Mediterranean small plates to West Wellington (and then a new name and family dining concept when that effort didn’t work). But it moved out, Supply and Demand shifted in and things have looked up. But I hope Evoo sticks. Notwithstanding some concerns with the unevenness of the food, there is much promise here. For one, the place has avoided the classic clichés of ‘this is a Greek restaurant’ (nothing blue, not an ionic column in sight) and for that we are grateful. The space is inviting, comfortable, in shades of beige and black, with modern angles and edges, softened with raw timber, Edison lights, tufted banquettes. There’s a handsome bar, where family and friends seem to be perched, and where hangs a TV, and though I do hate those things in restaurants, this one’s not particularly intrusive. The service is delightful. April Miller is a charming host and her husband Elias is burbling over with enthusiasm. They’ve hired the balance of the staff well, some of whom are apparently relatives. 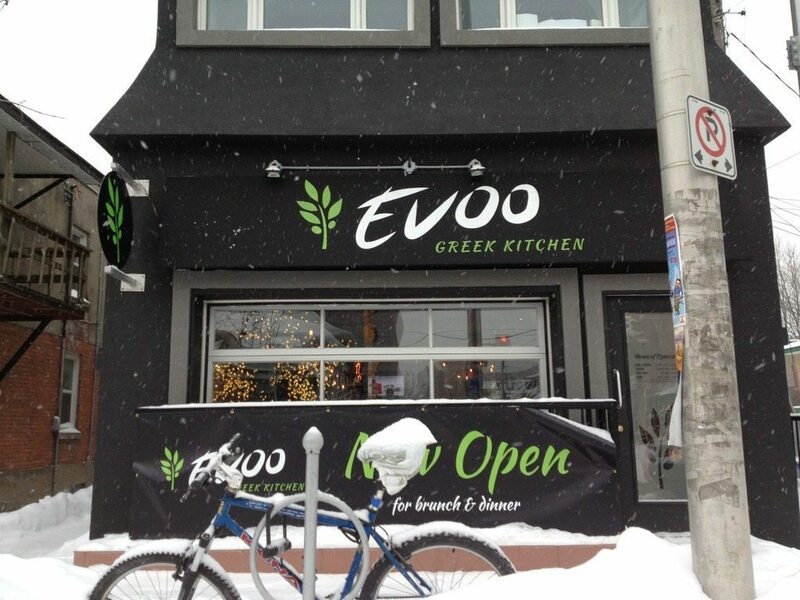 Evoo Greek Kitchen is now in its third month. I did a quick lunch review of it shortly after it opened, but returned for a proper taste last week. We liked every dip we tried, particularly those featuring eggplant. The melitzanosalata, for instance, with roasted red peppers, was a winner. Served with good grilled pita, and generously to boot. We liked too the principal proteins. There’s an octopus dish that deserves a much more rustic plating, but the mollusc itself was splendid. Tricky to pull off, octopus — its edible bits are rubbery and tough — and so it must be treated right, tenderized, cooked low and slow, and then flame-charred, and this one was a winner. We liked it better than the fried calamari, which could have used more seasoning. They might consider renaming the ‘chopped chicken’ main dish. The Greek translation (‘Spasti Kota’) doesn’t sound particularly scrumptious either. But the whole bird was. It came bathed in oil, lemon and garlic, sectioned, on the bone, and dripping with chargrilled flavour. Its plate mates were on the dull side, however. The patates lemonates suffered from sogginess, the house wedge fries were forgettable, and both could have used more seasoning. I didn’t want to like the lamb as much as I did. The menu states loud and proud that it’s from Washington State. Elias told us he discovered this lamb in Vegas and it ‘blew his mind’. He was determined to bring it to Ottawa. And so he has. At the moment the only cut are chops — perhaps we’ll see some more interesting dishes with the balance of the beast — but this was beautifully marbled, delicious meat, roasted to medium rare. Less successful (and the only dud of the dinner) were the stuffed peppers. One red, one green filled with mushy white rice (not the promised wild), studded with raisins, pine nuts, parsley, and generally pretty dull. The look of the room may be modern, but the dishes are all plated with the silly flotsam of a few decades ago: ye old bit of radicchio, spear of Belgian endive, parsley, wedge of lemon, red onion. And though Mom Theodossious’ galaktoboureko, a Greek custard pie, was delicious (and much less sturdy than my lunch stab at it), must we have it with a dump of icing sugar? We did better with the walnut cake served with vanilla ice cream and no goofy garnish. Small matters, really. Easily fixed. There’s a good selection of Greek wines on offer, a long cocktail list and a couple of Greek beers (along with Beau’s on tap).